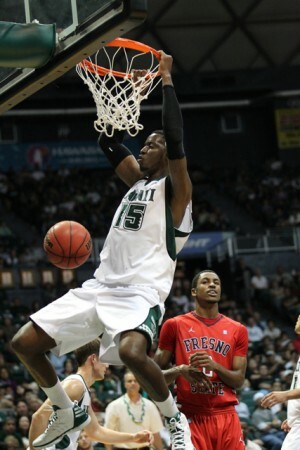 “Grinding” out a tough home victory over longtime Western Athletic Conference rival Fresno State, Hawai’i held off the Bulldogs, 62-58, Saturday night before an announced crowd of 7,780 at the Stan Sheriff Center. Junior center Vander Joaquim scored a game-high 23 points and grabbed 12 rebounds as the Warriors improved to 14-10 overall, 6-4 in the WAC. The Warriors are in fourth place in the eight-team WAC with four games remaining in the conference’s regular season. The Bulldogs fell to 11-16 overall and are in seventh place at 3-8. The Warriors needed to grind, especially with scoring leader Zane Johnson still mired in a shooting slump that left him with a season-low four points after going 2 for 8 from the field. Johnson did not hit a 3-pointer for only the second game this season, going 0 for 5 from 3-point range. However, he came up big at the other end, holding WAC scoring leader Kevin Olekaibe to only six shot attempts and just eight points. Olekaibe entered the game averaging 18.2 points per game, ranking among the top five sophomores in the country. He also ranked among the top 10 in the nation with 75 3-pointers prior to the game, but went just 1-for-4 from 3-point range against the Warriors. UH jumped out to a 12-1 lead in the first seven minutes but Fresno State responded with a 13-4 run that cut it to 16-14 on Kevin Foster’s layup with 7:38 remaining in the first half, then closed to 18-17 after a 3-pointer by Olekaibe 40 seconds later and tied it at 24-24 on Foster’s putback with 4:32 left. Joston Thomas stuck a jumper to put the Warriors back up at 26-24 with 2:53 remaining, then Joaquim slammed home a dunk to give Hawai’i a 28-24 halftime lead. Point guard Miah Ostrowski dropped in a running bank shot in the lane to make it 33-26 just under two minutes into the second half, but Jerry Brown III quickly answered with a putback to start the Bulldogs on an 11-2 run that gave Fresno State a brief lead at 37-35 on Brown’s layup with 15:53 left. The Warriors then responded with a 10-0 run capped by Brereton’s jumper that made it 45-37 with 12:22 remaining. Ostrowski later banked in another short runner to put UH up, 57-48, with 6:46 left, but the Warriors would go without a field goal for almost four minutes minutes as the Bulldogs closed it to 58-56 after Tyler Johnson’s two free throws with 4:03 remaining. Thomas then sank two free throws at the 3-minute mark and Zane Johnson drained a 15-foot jumper from the left wing with 34 seconds left to make it 62-56 after initially having the ball stripped by Olekaibe on his way up the first time. After Ostrowski missed the front end of a 1-and-1, Tyler Johnson’s putback cut it to 62-58 with 12.5 ticks on the clock. Fresno State then intercepted the ensuing inbounds pass near halfcourt, but Steven Shepp missed a 3-point attempt with six seconds showing and then Olekaibe misfired on a desperation 3 at the buzzer. Joaquim scored 13 of his 23 points in the second half. He shot 10 of 14 from the field, including 6 of 7 in the second half. In two victories over the Bulldogs this season, the 6-foot-10 Joaquim had a total of 46 points and 28 rebounds, while shooting 19 of 25 (78 percent) from the field. Brereton added 12 points and five rebounds, and Thomas finished with 11 points. Ostrowski had four points and a game-high seven assists against just one turnover. Sophomore forward Trevor Wiseman — coming off a one-game disciplinary suspension — contributed six points and two rebounds in 19 minutes. He received a rousing ovation when he made his initial appearance off the bench early in the game. Brown III led Fresno State with 17 points, Tyler Johnson added 10 points and Foster pulled down a game-high 13 rebounds. The Warriors next face New Orleans in a non-conference game Tuesday at the Stan Sheriff Center. The Privateers, who are considered a NCAA Division II program, have a 15-11 record this season. i like that were starting to see Breretons game..skills smarts and toughness…good to see Wiseman back…great TEAM win!.. I think that for most mid-majors to compete against marquee teams they need to have good 3 point shooting. It is possible to beat a team like Kentucky if your shooters are hot and theirs are not. I don’t think you will be able to match them inside. 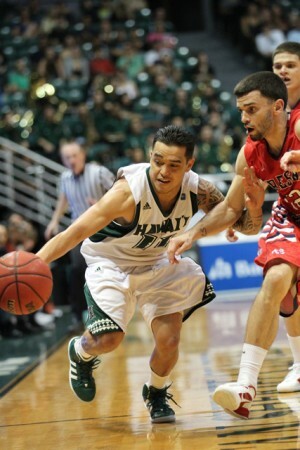 That said I think the fortunes of Hawaii will lie in how consistent our shooters will be beyond the arc. We struggle mightily when our 3 point shooting is off. In the Nevada game our inside play was good but outside shooting sucked. And in last night the key reason we pulled off this win was the fact that Fresno could not make their shots towards the end (Hawaii did play better defense however). So as Zane goes so does the Bows. And that goes for Hans, Miah and the rest of the long range shooters. 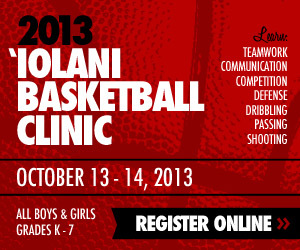 Hit your 3s and our bigs will have a field day. Don’t and our post season journey will be over in a hurry. Enjoy Hans all around game and consistency each game. He plays his role perfectly. His game is not to put up big numbers although he will a few games a year. But his value is consistency in defense and scoring 10 to 15 points a game. Can’t ask more from a hard working disciplined player (offense and defense) that he is. Good job, Wes and Dayton. OK, so Joston was indeed under the weather. There was a brief reference to the fact on TV prior to the Nevada game, and you could tell that he just wasn’t in attack mode the past two games as he had been the past several weeks. Even last night, he seemed to have a difficult time ratcheting up the intensity. Hope he shakes whatever is ailing him, and gets back to beast mode. It’s really good to see Hauns playing with confidence; he’s got such a solid, all-around game and his ability to pull up and hit the mid-range jumper is a weapon the team sorely needs. 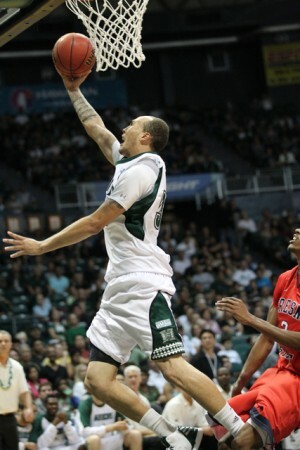 Hauns is my favorite player on the team, hope he catches fire throughout the wac tourney and into the big dance!!! Good to see Hauns picking up the productivity when Joston and Zane didn’t have it on Saturday night. Big win for the team.